Speed and Strength has decided to offer a classic leather jacket that includes one of the most important manufacturing concerns for Harley Davidson riders these days: Made in the USA. If you are truly looking to "Make America Great Again." Here is a chance to show it. The Speed & Strength America Rising Jacket does not have many technical details. 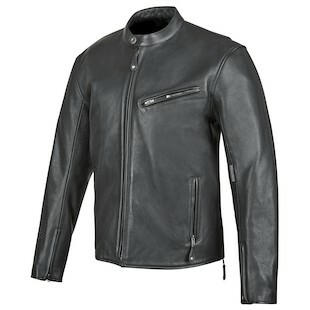 It is a very stripped down, classic, but beefy 1.33mm cowhide leather jacket, offered in one color (black). This jacket has perforation in the back, pockets in the shoulders and elbows for protection, if you choose to purchase and include them separately, a cafe style snap collar, gussets to help offer some additional shoulder movement, and additional pockets at both the chest, and waist. This jacket will have an American fit also, so you may need to size down in order to find the right fit. The biggest detail to provide of course is that this jacket is, in fact, made in America. Of course the price will reflect that as well ($600). So if you are willing to support American manufacturing, here is your chance.